I know, I know. Hamburger buns from scratch? When they’re only a couple of bucks to buy at the grocery store, who has the time? I’ve been making an effort to make time for more homemade breads this year – and I was completely blown away by these hamburger buns! I’ve always known that bread baked in your own oven was always more substantial than the it’s airy store-bought counterpart. But, I really didn’t think it would make that much of a difference in a burger. I couldn’t have been more wrong! This bun will hold up to any burger and toppings you should choose to pile onto it. And yet, it still manages to remain tender and really “hugs” the burger – soaking up all the delicious, beefy juices that manage to make their way out. A batch of dough for these guys was the perfect amount for us. Made just enough for all of us to have a burger, and then I froze the other half for a dinner later in the month. Most breads and doughs freeze so beautifully, it’s always so handy to have in the freezer for an easy meal. In a bowl of an electric mixer, dissolve the sugar in the warm water. Sprinkle the yeast over the surface and let sit for 10 minutes. If the mixture hasn’t started to get frothy, start over. Add the warm milk, oil, salt and 1 1/2 cups of flour to the yeast mixture. Beat vigorously for 2 minutes. Add an additional cup of flour and then the remaining flour 2 Tbsp at a time, until the dough begins to pull away from the sides of the bowl. This particular dough should be quite slack, i.e. very relaxed in order to make soft and tender buns. So you want to add only enough more flour, past the 3 cup point, to make the dough just kneadable, sprinkling in only enough more to keep it from sticking to you or the work surface. Switch to the dough hook and knead until you have a smooth and elastic dough, about 7-9 minutes. Transfer the dough to an oiled bowl. Turn once to coat the entire ball of dough in oil. Cover with a dampened towel and let rise until doubled, about one hour. Turn the dough out onto a lightly oiled work surface. Working with oiled hands, divide the dough into 9 equal pieces (a bench scraper and kitchen scale come in handy here). Shape each piece into a ball, and flatten into 3 1/2-inch disks. For soft-sided buns, place them on a parchment or silpat-lined baking sheet a half-inch apart so they will grow together when they rise. For crisper bun, place them three inches apart. Cover with a towel and let rise until almost doubled, about 45 minutes. 15 minutes before you want to bake the buns, preheat the oven to 400. Just before baking, brush the tops of the buns lightly with the egg wash and sprinkle with any desired toppings. Bake for 15-20 minutes or until the internal temperature of the bread reaches 190. When the buns are done, remove them from the baking sheet to cool on a wire rack. This will prevent the crust from becoming soggy. Wow. Think i’ll have to try these the next time we do burgers. Yours look fantastic! 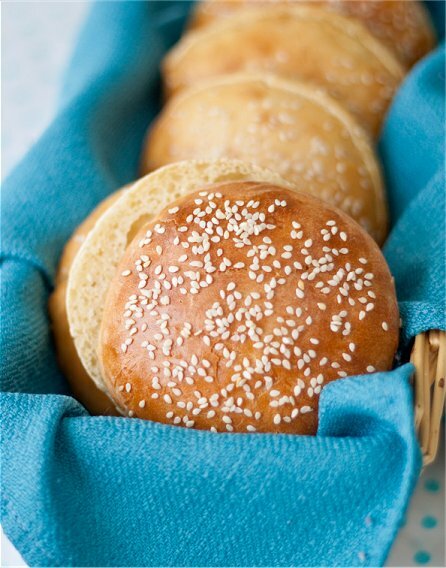 Love baking bread…these buns look awesome. Must try soon! Homemade patties, homemade buns, homemade fries…who will ever need fastfood? Thanks for sharing. These look so much better than store bought! Hopefully I will have time to make these for grilling season! Made these and they came out great though not as rounded as the picture. I followed the directions exaclty. Taste, texture and color were good. I had a bit of trouble getting them all the same round size. I don’t have a scale (on my Christmas list). Next time I will make the ball, put it inside a 3″ oiled ring mold, form a disk them remove the mold. Easily can make 12 rolls if needed.